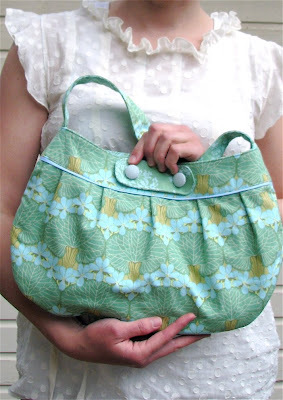 This week I’ve been messing around with the Buttercup Bag pattern for Mother’s Day presents. As many others have mentioned, I feel the original version is a bit on the small side (while I think it’s nice that it works from a fat quarter and is fab if you usually carry a small purse, it’s a wee bit small when your normal purse contents include a cloth diaper, a sippy cup, and a change of 2T clothing). So I tried out a couple different enlargements for Mom H (above) and Mom O (below) for Mother’s Day…I’m pretty pleased with how they turned out. Both were made with Amy Butler fabrics on both outside and inside and interfaced completely with flannel (I use a flannel sheet that accidentally got bleached in one corner and is no longer usable). 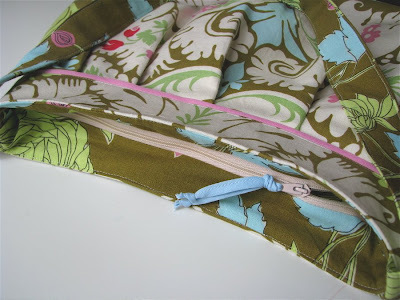 I also interfaced the top parts of both purses with heavy-weight fusible interfacing. I decided to try covered buttons for Mom H’s version (above); I love how they turned out all professional-like, and of course they match (finding two large buttons in my button box that match is rare and cause for celebration). I used some of the aqua dotted material left over from the Mendocino top I made last week. Covered button kits are sold for a couple bucks at my local chain fabric store and require no special tools, by the way (huge plus there). For Mom O’s version I tried a recessed zipper. 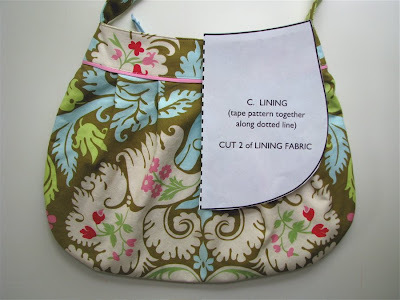 I found a tutorial Craftster where someone had made an enlarged Buttercup Bag with a recessed zipper, but it was so complicated I just gave up trying to understand the instructions and just winged it. So some of you are wondering, “How big are they, Rae?” Well I will tell you: I enlarged the pattern by 129% for both versions (I had read a few places that people had tried a 30% increase and it worked out well. 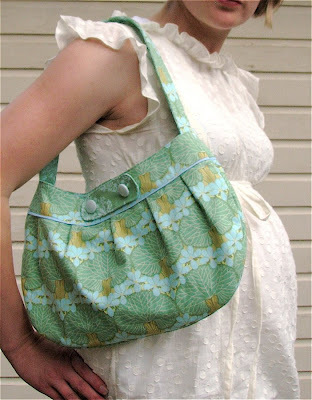 In fact, I noticed in the Featured Creativity Sew, Mama, Sew had up yesterday that one the projects was Kate’s Buttercup Bag which she had enlarged by 130). Additionally, on the longer version I added 2 inches of length (plus an extra 1/2″ on the lining for the zipper), and hacked off a little more than 1/2″ from each side of the top piece, so the pleats were also a bit bigger. Here’s a few comparison pictures (the yellow version above is the original pattern) so you can see the size difference. I know it’s hard on the bottom two, but look at my hands for scale. So I’d say that’s a win for Mother’s Day prezzies this year. Yay! If you’re still scrambling for a present idea there’s still time to make one before Sunday! Lovely bags. You did a wonderful job! I love the buttercup bag! I recently made 2 and would love a larger version. I am going to try it! Still like the little one best. 🙂 Love how the curve of the bag matches the curve of the belly in the 3rd photo – too cute!! 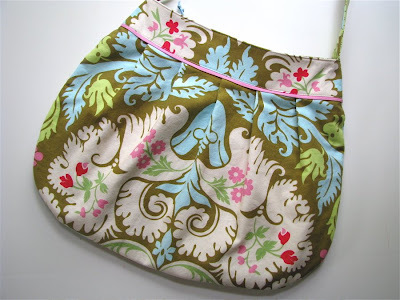 I really love the alternative sizing you did with this most fabulous bag! I think I need to try the bigger size too. I love reading through your thought process for each model. How awesome that you are going to offer a license for people to sell their own Buttercup bags! These look wonderful. Love the longer shape of the bag for mom O. Fabric choices are great as well. Hi! This is such a cute bag. Thank you for sharing the pattern. My 12 YO daughter sewed up her version for her older sister to use for prom. Pix on our blog. I am so glad I came to your blog, your bags are truly adorable!!! I love your patterns. 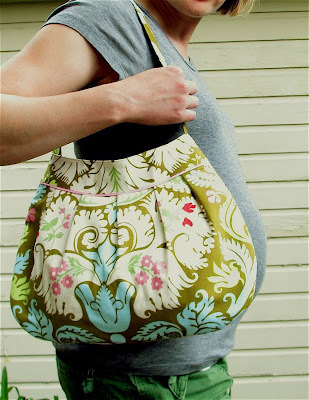 I call the little buttercup bag “the-going-out-without-the-baby” bag. So it is just the right size for that! i love the yellow gray pattern! where did you purchase the fabric? I am making one for my mom for Mother’s day and was going to try an enlarged version. (I know, it’s past mother’s day, but she’s been out of town) I can’t wait to see how she likes it. Okay, funny side note: I also have a Mom H and a Mom O! I read that in your post and was like, “No Way”! So great! I love the size and look of the larger versions. How/when did you add the contrasting fabric between the band and the body? I also tried the changes to the bag going by the information on Crafsters but it turned out a disaster. I would also like to get your version if possible. I bought the pattern. I know its been a while when you first posted this, but yours looks great with the zipper. 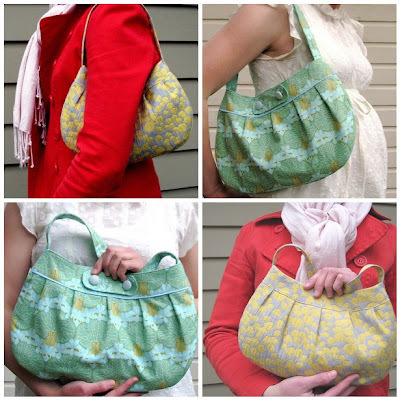 A quick question– ( the 'larger' sized buttercup bag) in the pay-for pattern– is it like Mom O's bag or Mom H's? Mom H's bag is truly gorgeous; so I have my finger's crossed! Yes, the "large" one is the same as the "Mom H" version! Thanks so much for the quick response, Rae! Any chance you have considered including a pattern with a zipper?